Soft and delicious this is the only Garlic Naan recipe that you will ever need! 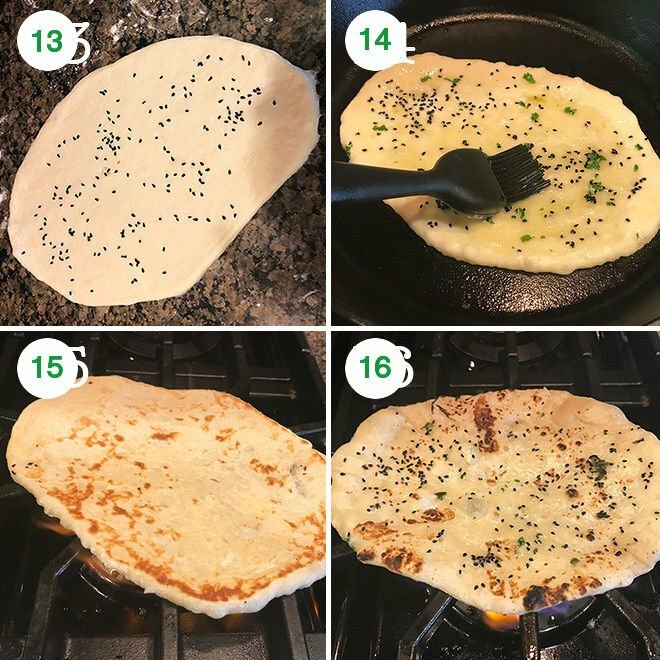 Make restaurant style garlic naan at home with this easy step-by-step recipe. 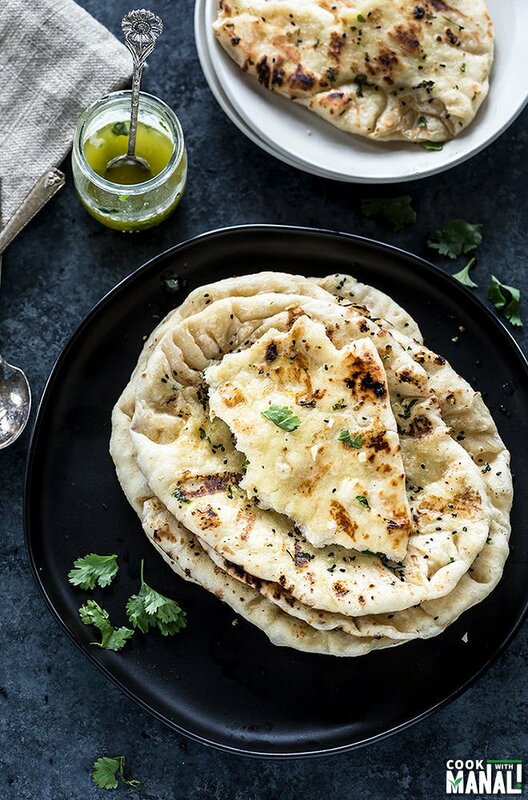 I am so excited to share this restaurant style Garlic Naan recipe with you guys! 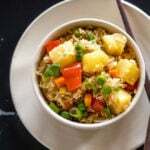 Guys, I made this recipe months ago. I remember the day the I made this, I could barely keep up with my excitement. 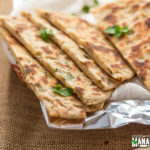 The reason was that these garlic naan turned out so good, like way beyond my expectations and I was so thrilled with the results that I wanted to share it on the blog immediately! But then few things came up, then we went to Europe, then to India and somehow, I never got around sharing this amazing garlic naan recipe. Well, better late than never! This recipe of Garlic Naan is the only recipe of naan that you will ever need, I promise! What Do We Need To Make Naan? Naan is a leavened bread hugely popular in South Asia. 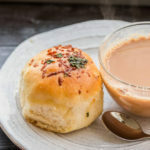 In India, it’s one bread that’s always on the menu of every party, wedding, birthday etc. Honestly speaking, naan isn’t something that people in India eat everyday at home. It’s something that we grew up eating in restaurants too. I don’t remember my mom ever making naan for us at home. What we had at home was roti and paratha. Naan was for restaurants, just like it is today. Like most breads, naan too is made with basic ingredients like flour, yeast, water/milk, sugar. I add some yogurt to it keep it soft and nice. Since this recipe is for garlic naan, I also add some grated garlic to the dough and then brush the naan with lots of garlic butter. Also, I highly recommend cooking these on a cast iron skillet. I have made these on non-stick and other pans, they taste so much better when made on a cast iron. ✓ is just like the one at your favorite restaurant! ✓ costs way less than buying naan from stores! I had a blast making this garlic naans at home. The thing with naan is that once you get the hang of it, you would never want to buy one from store. You know those rubbery, stretchy frozen naans that you get at stores? Seriously yuck! Plus, costly too! 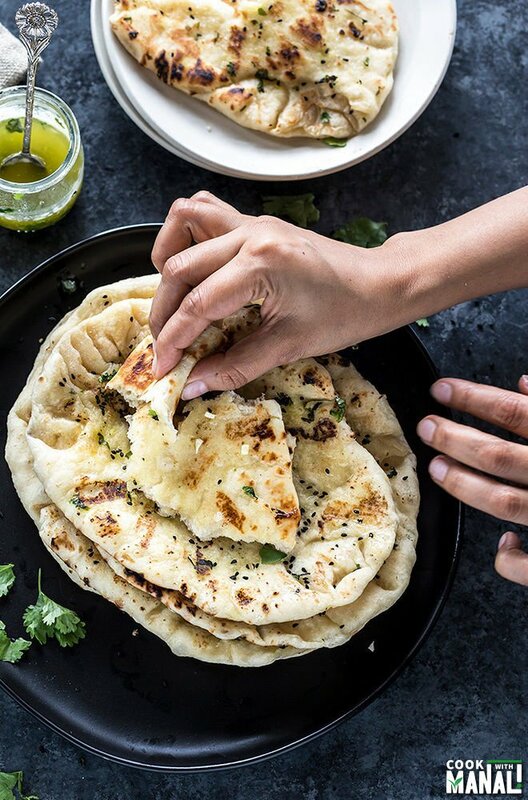 On the other hand these homemade garlic naan are soft, packed with fresh garlic flavor and you would have a hard time keeping your hands off them! I won’t tell you guys how many I ate straight out of the pan. But they were seriously so good that I have no regrets! 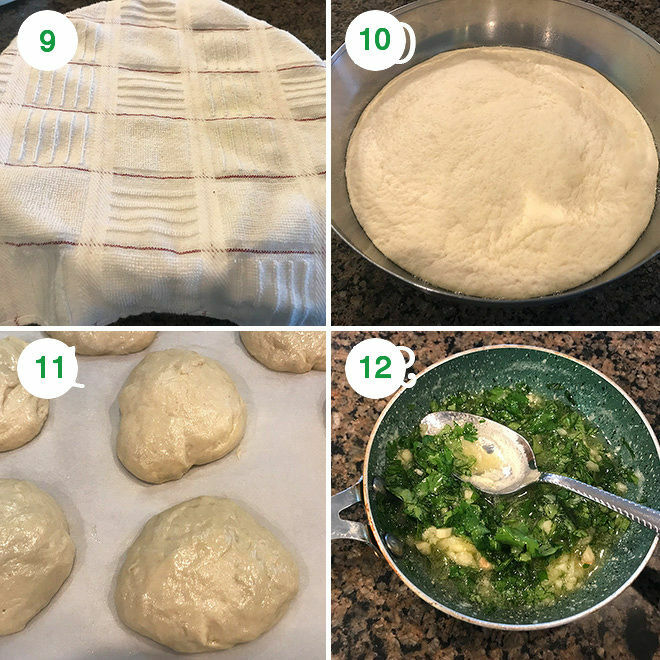 One Naan Recipe – Many Possibilities! This is a great basic naan recipe. 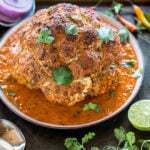 You can use the same recipe to make other flavors of naan. Butter naan: skip the grated garlic in dough. Brush with melted butter only (no garlic). Mint Naan: skip the garlic in dough. Mix dried mint with melted butter and brush the naan with this butter. Sprinkle fresh chopped mint on top. Pesto Naan: add little pesto, seal the naan and then roll again. Brush with melted butter. You get the idea, right? You can add so many seasonings here? Za’atar or chipotle anyone? 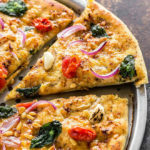 Can you make these garlic naan in advance and freeze them? Yes you can! To freeze make the dough, let it rise. Then divide the dough into equal parts and roll them. Place a piece of parchment paper and then place a rolled naan on top of it. Now place another piece of parchment paper on top of the rolled naan and then place another naan on top. Basically, you have to stack them one by one, with a layer of parchment paper in between each naan. Once you have stacked them all, place them in a freezer bag, squeeze out as much air as possible and freeze. 1- In a bowl whisk together 3.25 cups all purpose flour (423 grams) with 1 teaspoon salt. Set it aside. 2- To the steel bowl of your stand mixer, add lukewarm water and then add the sugar and yeast. Let it bloom for 5-10 minutes. 3- You will know the yeast is activated when its all bubbly and frothy on top. 4- Once the yeast in activated, add to it lukewarm milk, yogurt and oil. 5- Add the flour mixture and mix until combined. 6- Also add the grated garlic. Start adding the remaining 3-4 tablespoons of flour (27-36 grams). Add 1 tablespoon at a time and add more if the flour is too sticky. 7- I added around 3-4 tablespoons flour at this point. The dough will be sticky, so do not add more flour to make it dry. It just shouldn’t be very sticky. 8- Knead with hands or with the dough hook attachment of your stand mixer for 1-2 minutes until the dough is smooth. 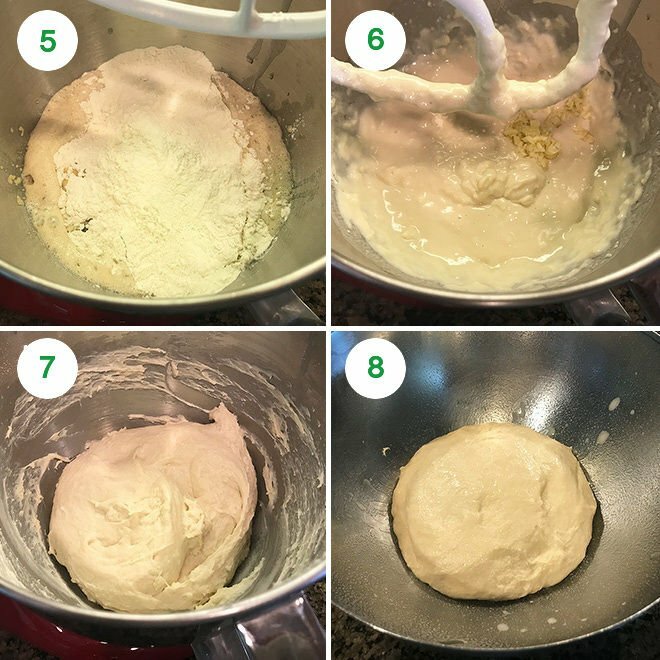 Transfer the dough to a greased bowl. 10- After around 90 minutes, the dough will be more than double in size. Punch the dough lightly to release the air. 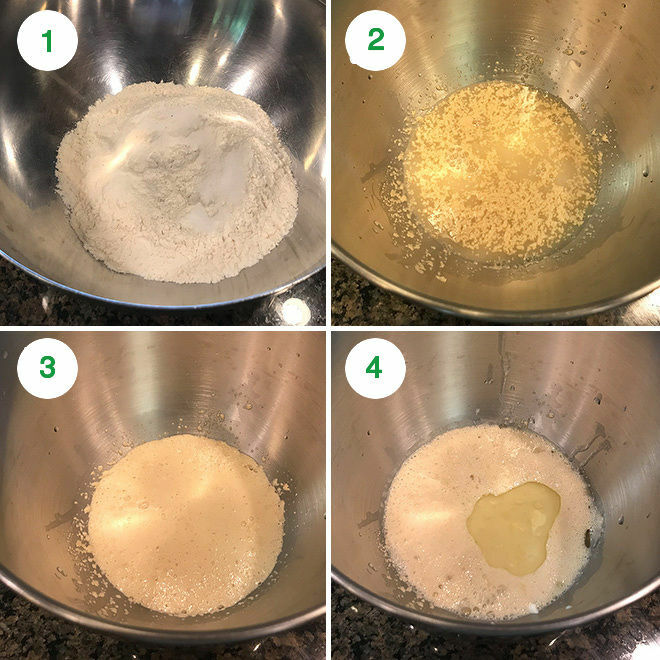 11- Divide the dough into 8 equal parts (around 100-105 grams each). Dough will be sticky so oil your hands while dividing the dough. Cover the dough balls with a kitchen towel and let them rest for 10-15 minutes. 12- Meanwhile melt 3 tablespoons of butter, add minced garlic and chopped cilantro to it. Keep the garlic butter ready to brush on the naan. 13- Heat up an iron skillet on medium-high heat. I really recommend using an iron skillet to make these naan. Take a dough ball and roll it into an oval shape, around 10 to 11 inches long and 6 inches wide. Apply little oil on top of the dough before you try to roll it. Also oil your roller. Do not try to roll the dough like you would roll a tortilla/roti/paratha. Simply stretch it length wise and then width wise. Dip your finger in water and then sprinkle some nigella seeds on top. This is optional. 14- Transfer the rolled naan onto the hot skillet. Let it cook for couple of minutes until you see bubbles on top. Brush the naan at this point with the prepared garlic butter. 15- With the help of a tong, remove the naan from skillet, flip and transfer directly to the gas. There will be a little mess as the butter will pour down – don’t worry, it’s okay. If you want you can cover your burner with aluminium foil before you begin cooking the naan. You can also skip the step of applying butter at this point and apply it directly once the naan is cooked. I like applying it twice –>more garlic flavor! 16- Cook the garlic naan for 15-20 seconds (directly on gas) until nicely golden brown from both the sides. Remove from heat and brush with more garlic butter. 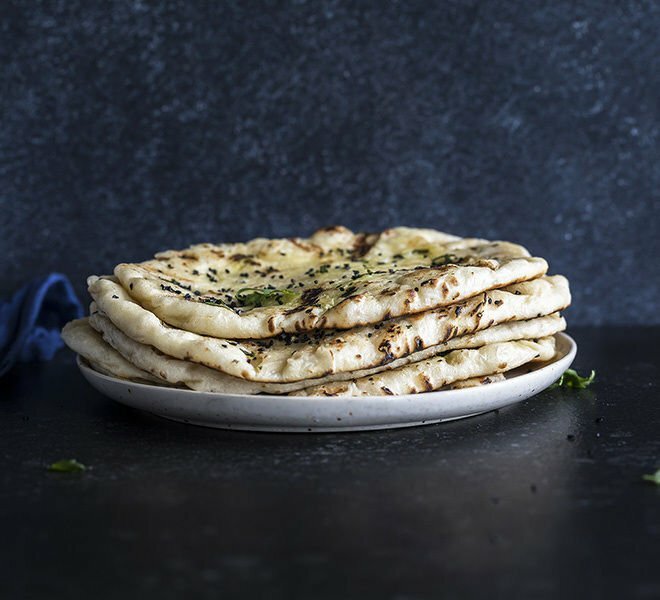 Serve these homemade garlic naan with dal makhani or butter paneer! To cook the garlic naan in oven – pre-heat oven to 500 F degrees. 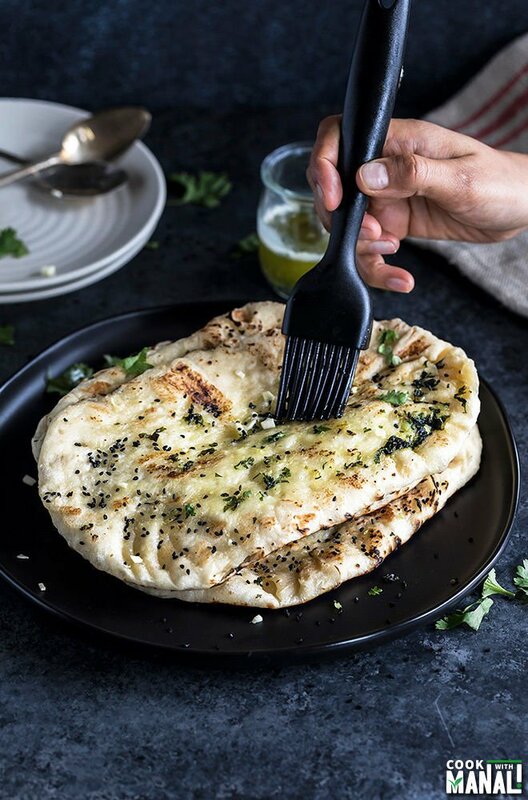 Arrange rolled naan on a baking tray and then bake for 4-5 minutes or until golden brown. Remove naan from oven and apply the garlic butter. If you want, you can place the naan in the oven under broiler to get them charred. 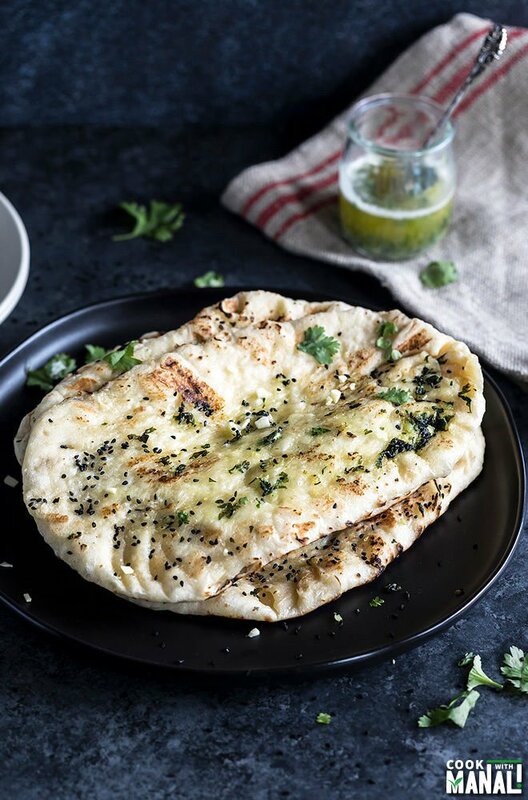 If you’ve tried this Restaurant Style Garlic Naan Recipe then don’t forget to rate the recipe! You can also follow me on Facebook, Instagram, Pinterest and Twitter to see what’s latest in my kitchen! 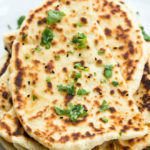 Soft and Buttery Homemade Garlic Naan - just like the one from your favorite Indian restaurant! 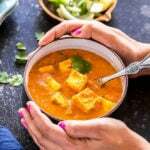 Enjoy it with your favorite curry! 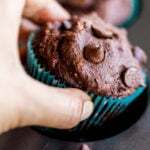 In a bowl whisk together 3.25 cups all purpose flour (423 grams) with 1 teaspoon salt. Set it aside. To the steel bowl of your stand mixer, add lukewarm water and then add the sugar and yeast. Let it bloom for 5-10 minutes. You will know the yeast is activated when its all bubbly and frothy on top. Once the yeast in activated, add to it lukewarm milk, yogurt and oil. Also add the grated garlic. Start adding the remaining 3-4 tablespoons of flour (27-36 grams). Add 1 tablespoon at a time and add more if the flour is too sticky. I added around 3-4 tablespoons flour at this point. The dough will be sticky, so do not add more flour to make it dry. It just shouldn't be very sticky. Knead with hands or with the dough hook attachment of your stand mixer for 1-2 minutes until the dough is smooth. Transfer the dough to a greased bowl. Divide the dough into 8 equal parts (around 100-105 grams each). Dough will be sticky so oil your hands while dividing the dough. Cover the dough balls with a kitchen towel and let them rest for 10-15 minutes. Meanwhile melt 3 tablespoons of butter, add minced garlic and chopped cilantro to it. Keep the garlic butter ready to brush on the naan. Heat up an iron skillet on medium-high heat. I really recommend using an iron skillet to make these naan. Take a dough ball and roll it into an oval shape, around 10 to 11 inches long and 6 inches wide. Apply little oil on top of the dough before you try to roll it. Also oil your roller. Do not try to roll the dough like you would roll a tortilla/roti/paratha. Simply stretch it length wise and then width wise. 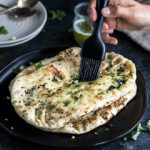 Transfer the rolled naan onto the hot skillet. Let it cook for couple of minutes until you see bubbles on top. Brush the naan at this point with the prepared garlic butter. With the help of a tong, remove the naan from skillet, flip and transfer directly to the gas. There will be a little mess as the butter will pour down - don't worry, it's okay. If you want you can cover your burner with aluminium foil before you begin cooking the naan. You can also skip the step of applying butter at this point and apply it directly once the naan is cooked. I like applying it twice -->more garlic flavor! Cook the garlic naan for 15-20 seconds (directly on gas) until nicely golden brown from both the sides. To cook the garlic naan in oven - pre-heat oven to 500 F degrees. Arrange rolled naan on a baking tray and then bake for 4-5 minutes or until golden brown. Remove naan from oven and apply the garlic butter. If you want, you can then place the naan in the oven under broiler to get them charred. These naan are pretty big. You can make smaller naan if you want! Thank you for posting this with detailed instructions. I was looking for these for months and last it’s here . Thanks for sharing the details to cook naan at home. My son love naan bread and insist me to try at home. Now we both are delighted to see your recipe. Thanks again. Awesome! Glad you liked it and thanks for sharing the tip with butane torch. I am sure it will help those who who don’t have a gas stove. How do you finally deal with the frozen naan? Cook frozen or defrost ? You can straight away put frozen in the oven or stove top..just cook a little longer..
Hi Manali, I made these tonight and had one issue- the dough was SO tender that when I tried to roll it out it would break. I’m thinking that I either should have added more flour in the dough (I only did 2 of the extra tbs) or I should have kneaded it more with the dough hook. I wanted the naan to be pillowy soft so I was hesitant to do either of those things, but it was unmanageable once I tried to cook it. I should add, I didn’t have a rolling pin so I tried stretching them like pizza dough. That’s when the middle would inevitably break. hmm maybe you should have let it rest a bit more…that’s what I do when it gets difficult to manage..I hope it still tasted good though..try adding little more flour next time and also rolling pin helps..
Just wondering if you couple leave the dough over night then roll the next night? First time ever to venture into making naan. And thanks to you, it was an outstanding success at our dinner club. The theme was, yes, Indian. Cast iron was an essential part of the final product.